To offer unique blend of superior quality products to our customers at reasonable price. The commitment and the expertise to become a leader among the jewellers, where leadership is not just being the biggest, but the best — in terms of people and their competitiveness, the Quality of our products, the Value we provide to our Customers, and all our business processes. Bindu Jewellery was founded by Mr.K.V.Kunhikannan in 1981. Born in Pilicode village near Nileshwaram in Kasaragod district, founder ventured into goldsmith work after completing his studies. 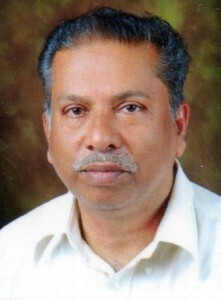 His consistent hard work and dedication let him to start a small retail showroom at Court Road, Kasaragod in 1981. He offered unique blend of superior quality products to the customers at very reasonable price which led to the exceptional growth of the showroom. In 1994, the 200 square feet showroom was renovated and expanded to a 1000 square feet showroom. His dedication and foresight inspired his son Mr Abilash.K.V and Mr Ajithesh.K.V to join the family business and in 2006, a new branch with 5000 square feet was opened at Ashwini Nagar, Kasaragod. 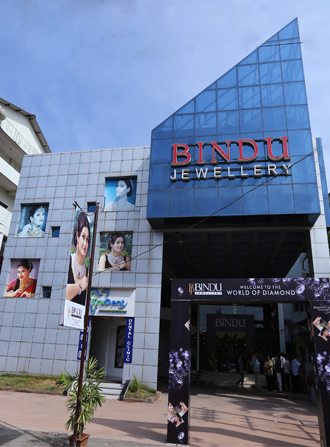 Their commitment and the expertise have helped transform Bindu Jewellery from a small showroom to one of the foremost jewellery brands in Kasaragod. Quality is what we are most concerned about here as there is no compromise on quality. Our mission is to offer unique blend of superior quality products to our customers. We do not carry anything that is not well made. Our job is to ensure each client is getting the best quality for the money they spent. We attribute our success to our dedication and uncompromised service to our customers. We are committed to provide our customer with the best service possible. We consider each sale as an everlasting relationship, and believe in keeping our customers always satisfied by protecting their rights and offering the finest products through our quality conscious efforts. Our philosophy is to give Quality sales and Customer service. Our future holds the promise of even greater achievements, provided we remain forward-looking, performance-oriented and agile, capitalize on our strengths and eliminate our weaknesses. What we do have is the vision, the commitment and the expertise to become a leader among the jewellers, where leadership is not just being the biggest, but the best — in terms of people and their competitiveness, the Quality of our products, the Value we provide to our Customers, and all our business processes. We continue to develop our staff and try every means to improve our service and product quality. Your needs and feedbacks are important to us; please contact us for your comments. Many thanks for your past support and we look forward to serving you in near future. Exclusive collection of certified diamond, silver and birthstone ornaments. 100% transparency of each product with barcode specifying weight, stone weight, making charges and stone price. Offer customized design options to our customers. Gold purity analyzer to check the purity of gold while buying and selling of ornaments. Exchange ornaments within 10 days without any deduction in making charges and gold rate. ‘Zero deduction Exchange Policy’ provides you a non deduction in the weight or rate of gold, upon its exchange ever. Lifelong guarantee and free maintenance for ornaments.. Experienced and well trained professional sales executives. Spacious car parking facility to park over 20 cars.